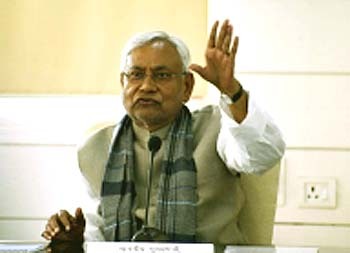 Patna, Feb 5: Bihar Chief Minister Nitish Kumar on Monday said no one has any concern for the country and that political parties are only concerned about the votes ahead of the upcoming Lok Sabha polls. "Desh ki chinta kisi ko nahi hai. Rajnitik dalon ko kewal vote ki chinta hai," Nitish Kumar told the media in Hindi when asked about West Bengal Chief Minister Mamata Banerjee's dharna in protest against the CBI in Kolkata. Banerjee has been on a sit-in since Sunday night after the Central Bureau of Investigation (CBI) officials showed up at the residence of Kolkata Police Commissioner Rajeev Kumar for questioning him in connection with their probe into a ponzi scheme scam case. Refusing to say anything on Banerjee's dharna against the CBI action, Kumar said now the case is in the Supreme Court and only court can say anything. However, he said one or two months ahead of the upcoming Lok Sabha polls, many such developments would take place in the country. "Look forward to many more in the coming days."